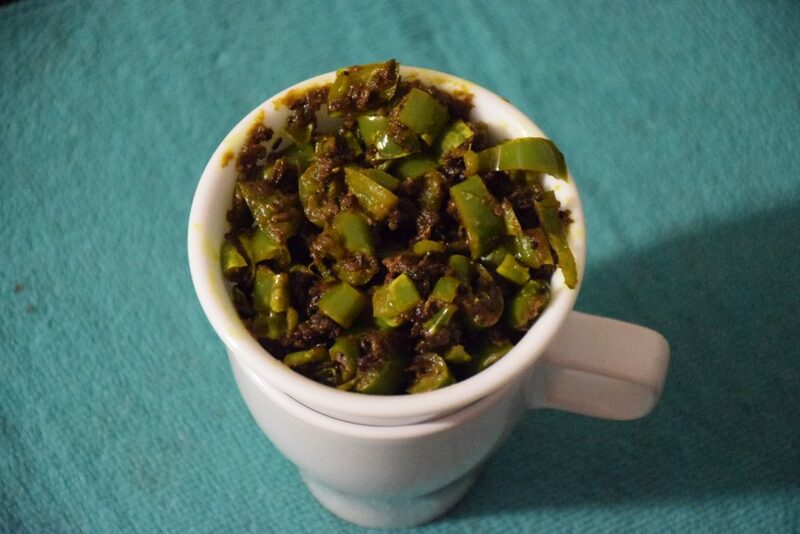 Before the Auspicious Navratri begin in India, lets enjoy some pickles .. 😀 This “Mirchi ke Tipore” or “Tapore” is an easy, handy recipe for making home-made pickle in minutes. 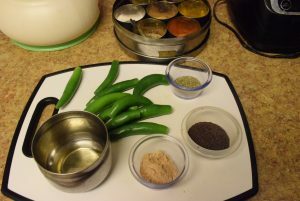 All you need is a pair of gloves , chilies and spices. I first ate it in My Bua’s (Aunt) home . After marriage , I visited her for the first time. My Cousin sister Rakshita (Reshu di) prepared this with a lot of food that my Bua offered to us. Since then , I have had it many times at my mom’s , at a friend’s place. 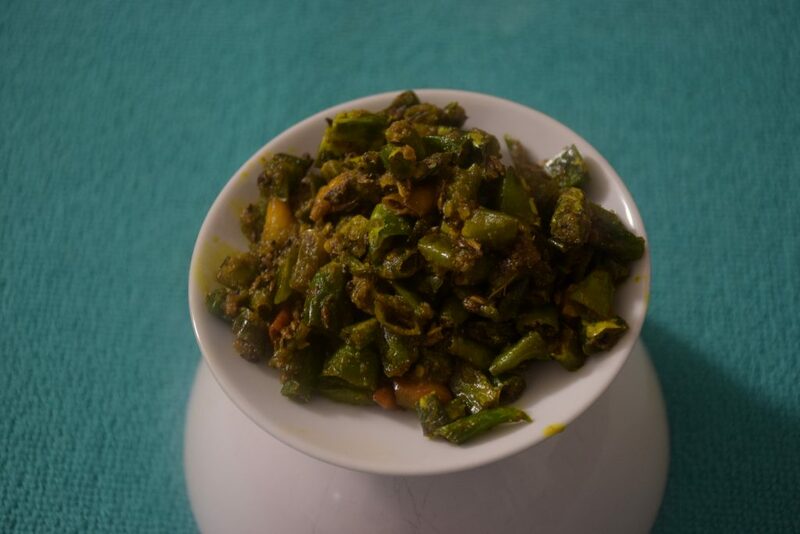 But tried this recipe just last year, owing to my hubby’s craving. He rarely eats pickles, but this is his favorite like “sirke ki pyaz“. 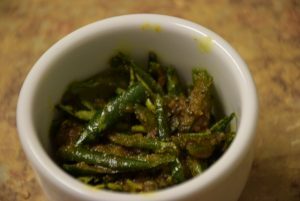 I am sharing the Rajasthan version of this recipe, if you have prepared it in a different way, I would be happy to learn that too. So bring it on ! 1. Wear your kitchen gloves first. 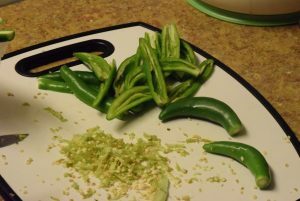 Although, your hands might not be sensitive to chilies,but better be safe than sorry. 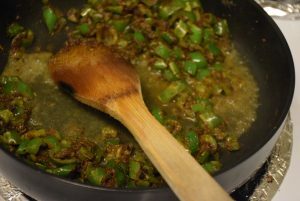 Wash the peppers in cold water,wipe them and remove their stems(danthal). 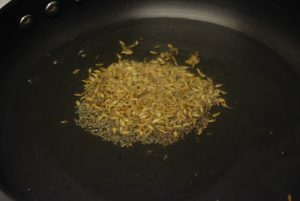 Slit them in halves and scrape them with your knife to remove all the seeds. 2. 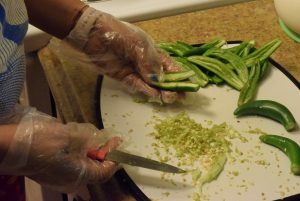 Now chop them finely or the size you wish. 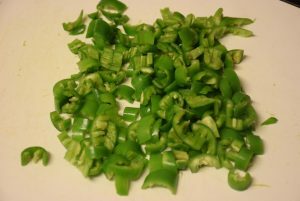 You may add just slit peppers too ,like I did last time. 3. 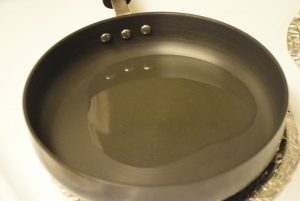 Heat oil in a wok (kadhai) or wide pan. 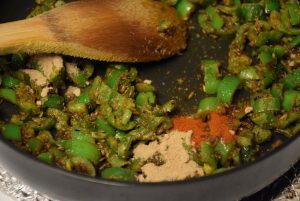 Once it is hot , add rai and jeera. Let them sputter. Stir and add hing. 4. Now add the haldi, dhaniya and saunf . 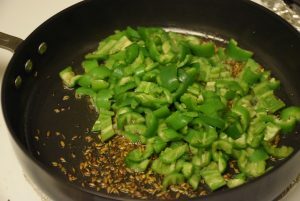 Quickly toss the chopped peppers and stir them together. 6. In the end Add salt and water and cover the lid. 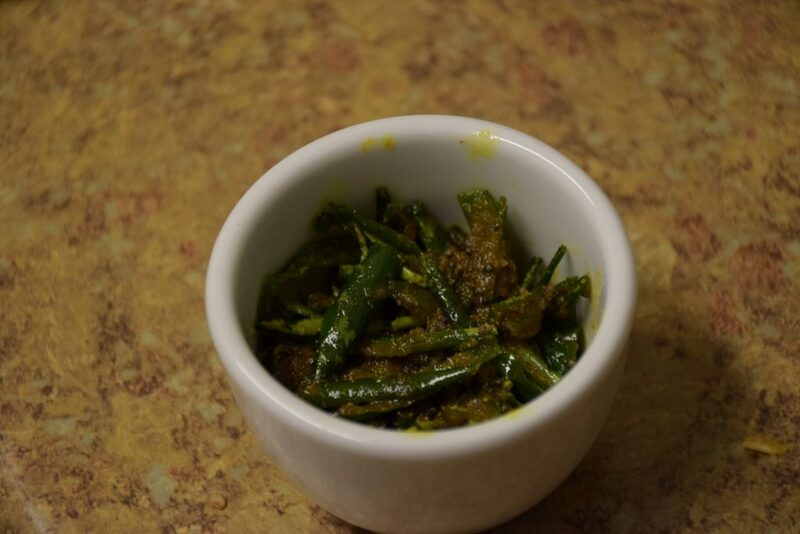 If you don’t have amchur, you may add lemon juice now .Let it cook for 3-4 mins or till the water dries up. 7. 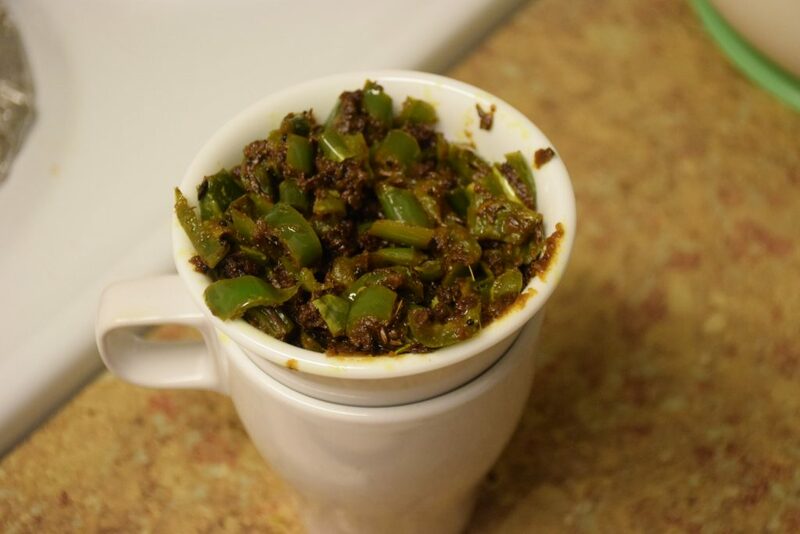 Once you see the mixture is dried up and the chilies are cooked ,take them off the heat. Empty them in a container and enjoy ! 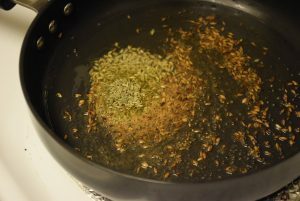 If you don’t wish to add water, you can add more oil in the first step. If you have any similar recipes to share, write to me in the comments below, would love to hear from you ! 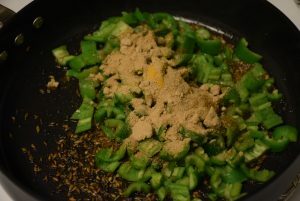 Till then keep cooking .. 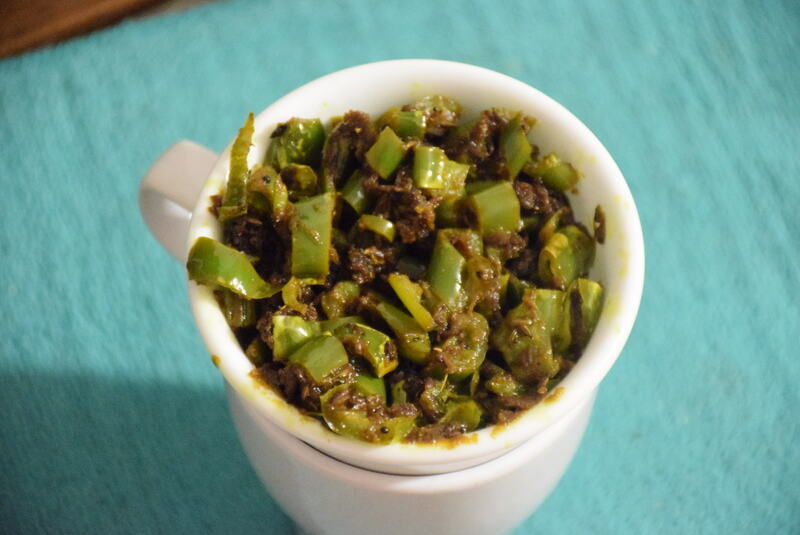 This entry was posted in Dips and pickles and tagged amchur, anardana powder, Carenshare, chaat masala, chilies, easy, hing, Indian chilies, Jhatpat achar, khatai, kitchen gloves, mirchi ke tipore, peppers, pickle crave, prompt craving, quick, ready in minutes, ready-to-eat, serrano peppers, shweta jindal, soonth, Thai chilies, week in refrigerator, zindagisikhati.